Fall in the value of money When the level of currency of a country exceeds the level of production, inflation occurs. Value of money depreciates with the occurrence of inflation. Buys fewer goods and services . Consequently inflation also reflects erosion in the purchasing power of money. This in turn reduces the value of money as for each commodity we have to spend more than the previous one . In Economics, the Word inflation Refers to General rise in Prices Measured against a Standard Level of Purchasing Power. Stagflation – In this types there is fall in the output and employment levels . Due to various pressure , the entrepreneurs have to raise price to maintain their margin of profits . But as they only partially succeed in raising the prices , they are faced with a situation of declining output and investment . Thus on one side there is a rise in the general price level and on the other side there is a fall in the output and employment . Open Inflation - The rate where Costs rise due to Economic trends of Spending Products and Services. Suppressed Inflation - Existing inflation disguised by government Price controls or other interference in the economy such as subsidies. Such suppression, nevertheless, can only be temporary because no governmental measure can completely contain accelerating inflation in the long run. It is Also Called Repressed Inflation. Galloping Inflation - Very Rapid Inflation which is almost impossible to reduce. 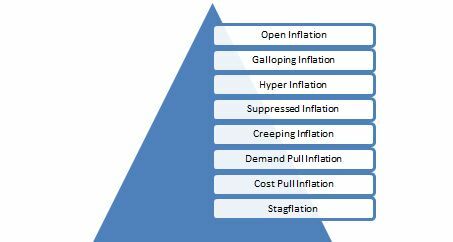 Creeping Inflation - Circumstance where the inflation of a nation increases gradually, but continually, over time. This tends to be a typically pattern for many nations. Although the increase is relatively small in the short-term, as it continues over time the effect will become greater and greater. Hyper Inflation - Hyperinflation is caused mainly by excessive deficit spending (financed by printing more money) by a government, some economists believe that social breakdown leads to hyperinflation (not vice versa), and that its roots lie in political rather than economic causes. They add inefficiencies in the market, and make it difficult for companies to budget or plan long-term. Uncertainty about the future purchasing power of money discourages investment and saving. There can also be negative impacts to trade from an increased instability in currency exchange prices caused by unpredictable inflation. Inflation rate in the economy is higher than rates in other countries; this will increase imports and reduce exports, leading to a deficit in the balance of trade. Inflation rate and the value of money (Or the purchasing power of money ) are inversely correlated . Hence , the value of money can also be measured with the help of price indices . The value of money declines when price index goes up and Vice-Versa.